Our preferred method of payment is our online Kindo system for any Donations and Fees. The facility of Eftpos/Visa can be made available in the office. As a school we are very reliant on school donations to ensure we can continue to support our students with quality resources for learning. Last year’s donations helped pay for library resource, digital technologies, and literacy and maths resources across the school. During the year students participate in some or all of cooking, science, technology arts and craft activities. This fee helps cover costs in delivering these meaningful learning programmes. Our stationery packs are a convenient and cost effective way of purchasing your child’s stationery and will be sold as full packs only. When payment is received, packs will be delivered directly to the classroom. 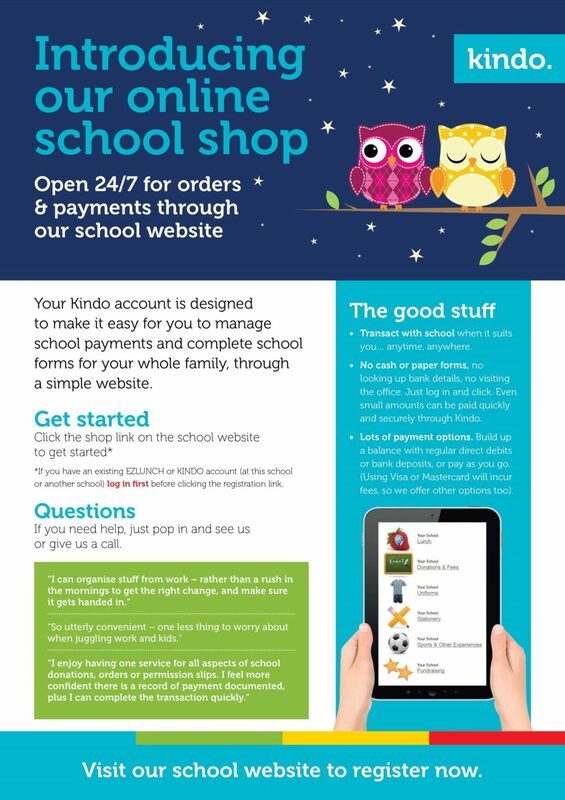 Payment can be made via Kindo or at the School Office.